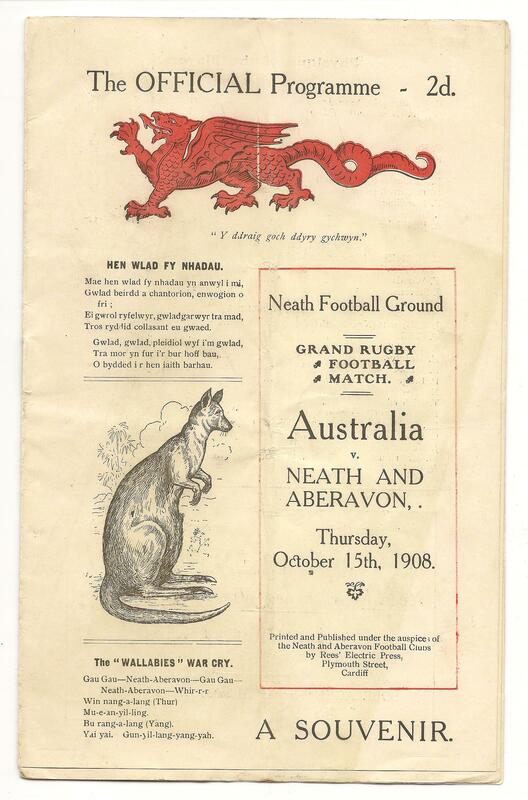 The sixth match of the 1908/09 Australian tour was against a Combined Neath & Aberavon side played at the Gnoll (Neath). The combined side wore “all-black” kit with a white Maltese cross on the front of the jersey. For the first 15 minutes the home forwards thoroughly tested the Wallabies, they heeled cleanly in the scrums and mauls and worked splendidly in the loose. Then in the twentieth minute of the game the Combined Captain D.H Davies retired hurt. Five minutes later Hickey, fielding a pass from McKivat dashed fifty yards in an electrifying burst of speed, fifteen yards from the try line he passed infield to second-rower Middleton “who had backed up superbly” passed to Barnett who offloaded to Griffin before Moran dived over the line wide out to complete what was possibly the best try of the tour up to that date. Carmichael converted and the Australians led 5-0. A sharp run by local left winger Willie Thomas had the crowd yelling encouragement, but Danny Carroll on the Australian left wing intercepted a pass and sprinted forty yards to place the football under the cross-bar. Carmichael converted to make it 10-0. The Wallabies final try came 10 minutes before full time when Richards, having broken through a line-out, cross kicked to Dix in the centres, who caught a ball high above his head and headed for the try line only to find his way barred by determined cover-defence and short passed to Carroll who surged over the line untouched. Carmichael converted yet again and the Wallabies led 15-0 & that is how the score remained. Australia: P.P Carmichael, C.J Russell, J.J Hickey, W Dix, D.B Carroll, F Wood, C.H McKivat, T.J Richards, H.M Moran (Captain), N.E Row, J.T Barnettm S.A Middleton, P.A McCue, T.S Griffin, E.J Mcintyre.